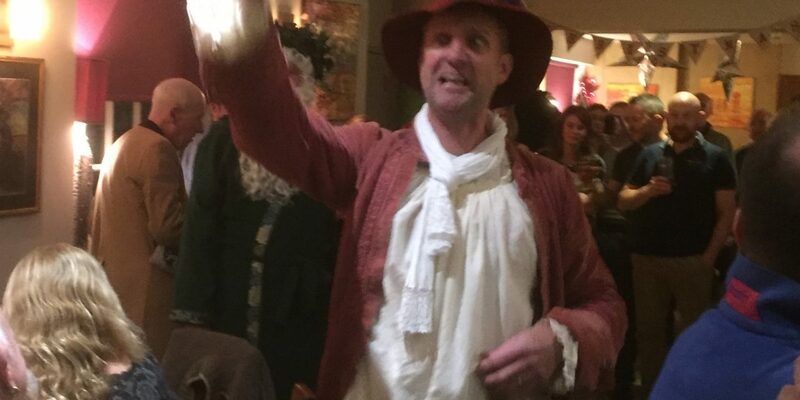 The Mummers tour of Lympstone pubs with the Village’s traditional play brought good cheer to all. 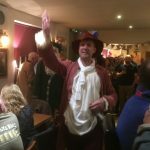 We don’t know the origins of our handed down script, but the verse of “Tom Bowling” sung at the end would have been well known to Lympstone fishermen some 200 years ago. 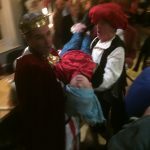 Like most Mummers’ plays, ours compresses England’s history – from the Crusades to Empire – into a noisy ten minutes of comical defeat and rude revival of past foes. We will stick strictly to the old script, unless the odd ad lib should creep in…. 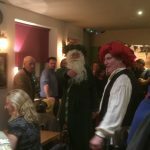 Lympstone Mummers burst thirstily into the Saddlers, fought their way through the Redwing, then the Swan and ended at the Globe at 10.00pm. A collection was taken for the Children’s Society. NextBoxing Day Swim attracts the brave and the bold!